Star Wars Rebels needs to make a choice. Are the characters aboard the Ghost more of a crew? Or are they more like a family? I think a crew-like dynamic would be a stronger choice. The characters would be forced to bond and connect, transforming from strangers into teammates, which makes a much more interesting piece of television, and a great moral for the show’s younger demo: Learning how to forge camaraderies in even the most stressing situations is a lesson all children should learn. A familial dynamic, on the other hand, isn’t a bad thing, but it tends to lead to writers grasping at the simplistic of family tropes and just run with it. This is exactly what “Fighter Flight” does, to the detriment of the characters and the show’s run so far. Ideally, a team dynamic with a metaphorical familial subtext is the best—for two great examples of that, watch Gargoyles or Avatar: The Last Airbender. Arguably, the pilot had a similar idea in mind, what with Ezra gaining his metaphorical family after being without one for so long, but what made that work so well was that the text of the episode emphasized connections and unity, both in Ezra and the crew as a whole. They were a team that bonded in a familial way. Here, the text leans way too hard into the family dynamic, with each character playing the role: Ezra and Zeb are the sparring brothers; Sabine is the smartass sister; Hera, the commanding mother; Kanan, the deadpan father. (Chopper is the annoying cousin, but more on him in the stray observations). Lest you think I’m reading way into this, at one point, Kanan literally says to Hera “You have to admit, it’s a lot more peaceful aboard with the kids gone,” without a trace of irony. Just an episode ago, the show dealt with the seriousness of Zeb and the near-eradication of his people. That kind of dramatic weight seems to be completely gone in “Fighter Flight.” To see Zeb go from a metaphorical “uncle with a tragic past” to a more literal “older brother who has had it with his younger brother” is jarring. Mainly, it doesn’t make for a good episode. It doesn’t really make a lot of sense for Hera to send Ezra and Zeb on a wild goose chase just to teach them a lesson—you know, since they’re on the run from the Empire. But even in accepting the premise, the team dynamic from the first two episodes is also absent: The slick interplay that allowed them to con the minister in “Droids In Distress” has been replaced by generic sibling bickering. Ezra and Zeb aren’t even at the same level, maturity wise, for this to work. Zeb is a full-fledged adult. “Fighter Flight” is set up mainly so Zeb and Ezra can commandeer and pilot a TIE fighter, and admittedly, some of that was fairly well done. I enjoyed the tracking shot of Ezra running across the rooftops with Zeb flying in the background, although the “Admit we’re even!” exchange was out of place. The episode tries to incorporate a little bit of drama by connecting Ezra to a Mr. Sumar, someone who Ezra knew in his childhood, but we never learn who he is, nor the exact nature of this relationship. 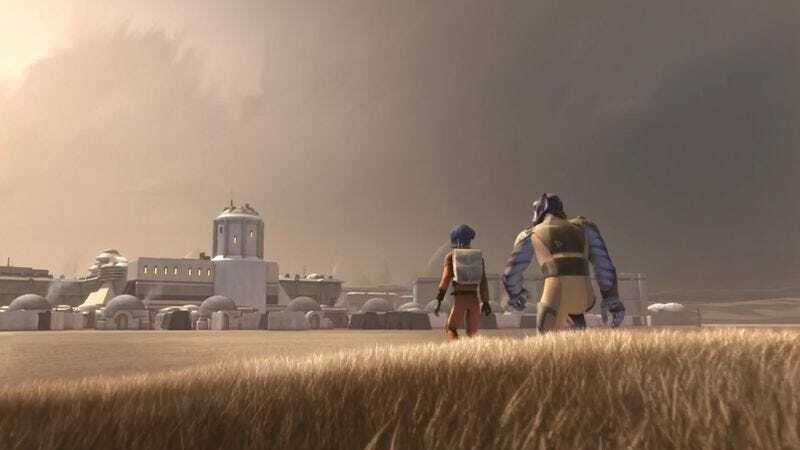 There’s no real meaning when he and Zeb go off to rescue him from the Empire; it would’ve been a lot more significant if they flew off to rescue total strangers. That would’ve forced them to bond over a common goal. Instead, we’re given a fairly mundane story with a meaningless sibling rivalry analogy, with a half-hearted attempt at tension. We’re no closer to the real origins of the Rebel Alliance, we have little understanding of the characters and their histories, and there’s no forward momentum in the show’s overall story (if there even is one). We didn’t even get to see any actual Jedi training from Kanan! If Ezra is just going to develop his Force skills on his own, then Kanan’s claim to start Ezra’s Jedi training is rendered moot. Just like this episode, really. So Chopper is going to be the show’s comic relief, huh? I suppose young children might get a kick out of his antics, but he’s less mischievous and more antagonistic. Also, he’s been useless in all practical matters. Last week I mentioned he’s going to be a real problem. This week pretty much confirms it. The less said about the whole Sabine “plotline,” the better. THIS WEEK IN EMPIRE EVILNESS: This is where we (sadly) ridicule the show’s approach to the Empire and its over-the-top villainy. Here they demand Mr. Sumar sell his farm to the Empire, and when he refuses, they return, blow up his hut, and capture him. a) What does the massive Empire want with some old dude’s farm? b) Why bother with civil requests if you’re just gonna take the farm by brute force later? If you’re going to do mustache-twirling evil, you might as well do it right. I’m not a diehard Star Wars fan. Like most people, I enjoy A New Hope, love The Empire Strikes Back, somewhat lukewarm on Return Of The Jedi, and possess varying degrees of disappointment in the prequels. So I like to thank commenters when they clarify a lot of the Star Wars lore and details that escape me. So thanks to John Sweden for explaining the Bail Antilles/Bail Organa confusion, Stormtroopa for explaining the orange pauldron on the Stormtrooper’s shoulder, and cappadocius for noting the uncertainty over the episode order!